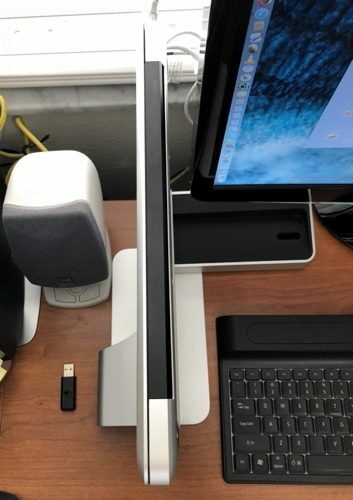 When you utilize both a desktop system, Mac Mini with a display, and you also use a MacBook Pro with a display with your MacBook in clamshell mode, you have to have sufficient desktop space to do so. I had used a large desk system that allowed me to utilize both units and still had space for odds and ends like speakers and other items. However when you move and you downsize the living accommodations, things change. That’s what has happened to me. I wound up with half of the space that I previously had available to me. Talk about a tight fit! Since the desktop unit is my primary, utilizing a 32” Samsung display, it took up a bit over half of the space available, also considering the external DVD/CD unit, the backup external hard drive and of course, the router and two speakers. I did not have the luxury of purchasing a larger desk for my use, not with the space that is available for me. 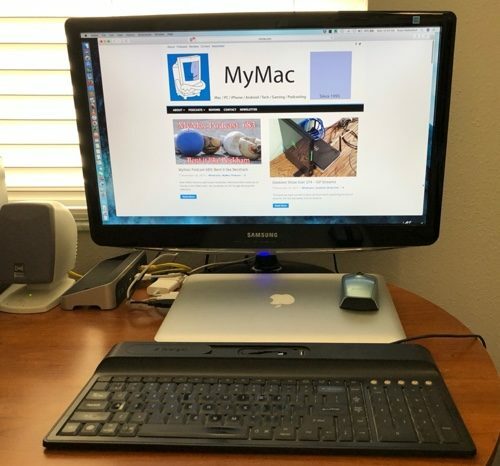 The mTower is easy to use and set up your MacBook for use in just a couple of minutes. 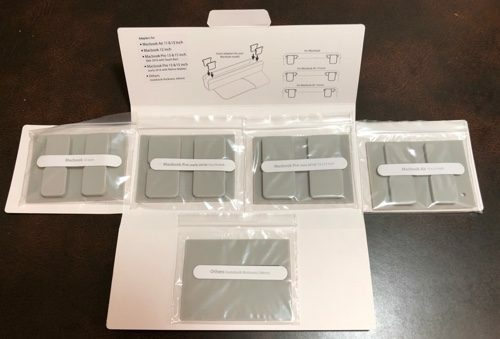 In the box containing the mTower, there is also a packet containing rubber adapters for different Apple laptops: MacBook Air 11& 13 inch, MacBook 12 inch, MacBook Pro 13 & 15 inch, MacBook Pro 13 & 15 inch (early 2016 with Retina display) and an adapter for other units, notebooks with a thickness of 24mm. The packet also displays the proper positioning of the adapters for each laptop. 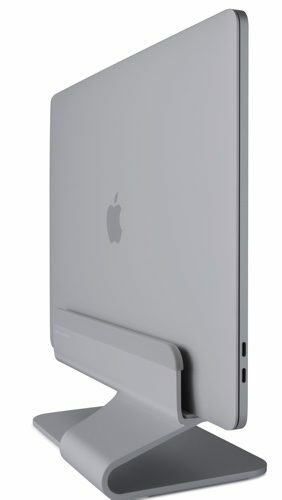 In case you are wondering, the mTower can accommodate MacBooks with a protective case with a total thickness between 0.68″ to 0.98”. Setting up the unit is simple; first, set up your MacBook for closed display/clamshell operation, position the mTower where you want it on your desk, insert your MacBook with adapters and you’re ready to go. 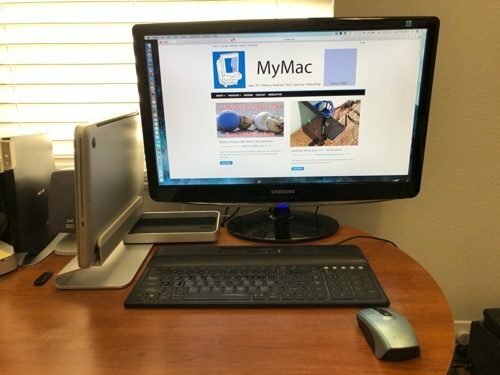 As you can see in the pictures below, prior to utilizing the mTower, my display was at the back of the desktop area, the MacBook Pro was in front of it and the keyboard in front of that. I had no room to use my mouse unless it was on top of the MacBook, not a good way to work. Setting up the mTower to the left of the display, I now had room for the keyboard and space to use for the mouse or for whatever else I wanted to do in front of the display. I highly recommend the Rain Design mTower unit for your consideration. When your space is at a minimum, the mTower allows you to take advantage of your vertical space and frees up your horizontal desk space. 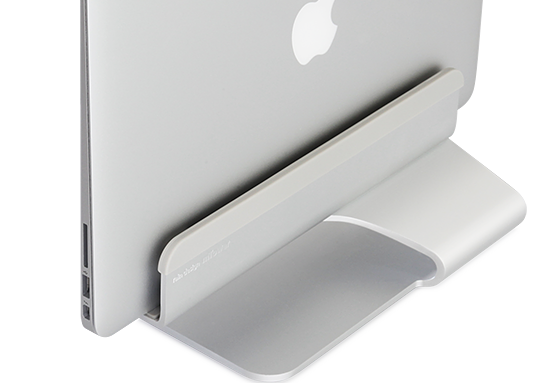 Positioning your MacBook in a vertical position also allows for better air circulation around your MacBook. Rain Design does provide a one year warranty against manufacturer’s defect and workmanship. Comes in standard aluminum but Rain Design has also come out with a Space Grey aluminum mTower Stand. All in all, I give the Rain Design mTower for MacBook a My Mac rating of 9 out of a possible 10.